Composite data types are hybrid types which are capable of holding components of varying data type. Oracle implements composite data type in two forms, either as PL/SQL records or PL/SQL collections. Collections are one of the efficient implementations of persistent composite types in Oracle programming language. A collection is a group of elements which are similar in type and property. The tutorial covers the basics of collections, its types and collection methods. Persistent collection – The collections which are physically stored in database are known as Persistent Collections. They are created as schema objects and are valid user defined types. Non persistent collection – The collections which are not stored in database are known as Non Persistent Collections. They are visible only within a PL/SQL block. Based on the behavior in a program, collections can exist in three types. Associative Arrays alias Index By tables. They are non persistent form of collection and maintain the index-value structure. They have sequential numeric or non numeric subscript. Nested Tables – Persistent form of collections, which hold index-value structure. Index is a hidden attribute and internally maintained by oracle. VARRAY – Similar to Nested tables with the difference that the number of element is fixed in VARRAY. Associative arrays were introduced in Oracle 7 release, with the name PL/SQL tables. Due to their structure, they were recalled as Index by tables in Oracle 8 and above releases. Owing to its similarity with the conventional arrays, Oracle 10g called it as Associative array. Associative arrays are simplest unit of ordered set of elements in a form of an array or list which can hold any number of elements. They are physically not stored in the database; instead they are declared within a PL/SQL block and are persistent within the scope of an anonymous block execution (in which they are declared). As stated earlier, associative array exist in index-value structure. In an associative array, an element value can be located based on the cell index (also known as subscript). The index has to be unique and can be of number or string type. In the above syntax, RAW, LONG RAW, ROWID, and CHAR are the unsupported index data types. The Associative array EX_MONTH_TAB holds the days in each month of the first half of the year. Note the string subscript and number value. Associative array do not require initialization in the DECLARE section, but exists as an empty collection. This implies that associative array constant cannot exist. Being a non persistent composite type, associative array value cannot be modified using DML operation. Associative arrays can be passed as subprogram parameters or can be return type of a function. The PL/SQL block below uses a local procedure P_ARRAY to print the associative array passed as input. Sort order of an associative array is based on NLS_SORT initialization parameter. If an associative array has to be passed to another remote database, keep note of NLS_SORT and NLS_COMP parameter values. If the values at target database are different from that of source, exceptions may occur. Associative array declared in Package specification behaves as Persistent collection. Associative array applications: Can be used as a small temporary data table, which can be reused every time the program is invoked. Nested tables are persistent form of collections which are physically stored in database (disk space consumption based on number of elements they hold). They are unbounded and distributed set of elements in key-value structure. As per the Oracle internal architecture, a nested table type is stored as a table structure. If a column of nested table type is included in a table, oracle generates a separate relational table to hold the data and actual column referring to it. This system generated table is maintained by the server and it is named in ‘SYS_NCXXXXX$’ format. The actual table column is marked as a Virtual Column by Oracle. During retrieval of a nested table data, the nested table rows are fetched in sequence of the subscript. Note that the subscript is not stored along with the nested table but Oracle implicitly maintains the index to identify each row in a nested table. Element type can be a User defined type or primitive data type, but cannot be REF CURSOR. Element types cannot be any of BOOLEAN, LONG, LONG RAW, NATURAL, NATURALN, POSITIVE, POSITIVEN, REF CURSOR, SIGNTYPE, or STRING. The example below demonstrates the creation of a table with a column of nested table type. Note the syntax to create the table with a nested table column. The table definition must specify an arbitrary name of separate storage table, which would be used by the server to hold column data. Amazingly, when the column was queried in USER_TAB_COLS view, it was discovered as a virtual column in the USER_TAB_COLS dictionary view. Oracle internally identifies a nested table collection type column as a virtual column. USER_NESTED_TABLES is another dictionary view which maintains the metadata of nested tables which are owned by the current user. The additional storage table (NESTED_COL2 in this case) is also maintained in USER_TABLES dictionary view, with NESTED column value as YES. Nested table in SQL as standalone type stored in database: In SQL, nested table is physically stored in the database. Later it can be used in an anonymous PL/SQL block or during table creation. We shall see the DML operations on nested tables and their Selection. Insertion: INSERT statement can be prepared using the nested table collection type. Selection: Conventional way of data selection from a table would get the data in complex and instance format. To get the data in the readable format, TABLE function can be used. It brings the nested table column data in relational format, thereby making it easy inferable. The update statement below updates the collection column in the table. Alternatively, it can be done using a PL/SQL block too. As a subprogram parameter: Nested table column can be passed as a parameter too. Additionally, it can be the return type of a stored function. The procedure P_CHECK_ARRAY counts of even and odd numbers in the input array. The PL/SQL block below uses the above procedure to verify the objective. 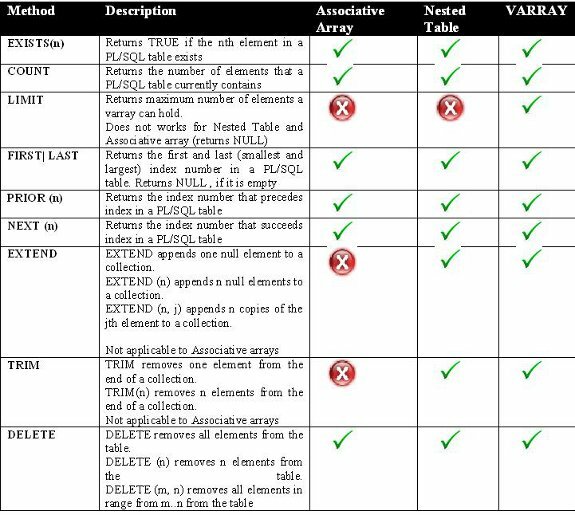 Nested tables as PL/SQL construct: Initialization and usage: When defined in a PL/SQL block, nested table variable remains uninitialized and NULL collection. It is mandatory to initialize it to make it empty, a non null collection; else it raises ORA-06531 exception. A PL/SQL block declares initializes and prints two nested table collection arrays. Collection methods used in the blocks are discussed later in this tutorial. In case of deletion of any element from a nested table, it is rendered sparse. Applications of Nested tables: They fit into almost major scenarios in real time applications. Mostly, when the number of elements is variable or not known, nested tables are the best choice. VARRAYs are enhanced version of nested tables, which were introduced in Oracle 8i. They contain limited and defined number of densely populated elements, whose index is sequential and numeric. The minimum bound of the index is 1, current bound is the total number of resident elements and maximum bound is the varray size. At any moment, current bound cannot exceed the maximum bound. In terms of handling and usage, they are similar to nested tables in major situations. VARRAYs can exist as schema objects, referenced from PL/SQL blocks, and can be stored in database tables. Unlike nested tables, which are always stored as separate storage table, varrays exist as single object in the same table. Only in exceptional cases when size of varray exceeds 4KB, it is relocated outside the table but in the same tablespace. Size_limit represents the maximum count of elements in the array. Being a persistent form of collection, varrays require initialization. Element_type can be one of the data type available till Oracle 11g. VARRAYs can be locally declared in a PL/SQL block and can be referenced within the scope of the block. The VARRAY created can be used as a column type. The example demonstrates the Insert and Update process. Oracle provides set of inbuilt methods, which can be used with a non null collection (except EXISTS), to yield some information and perform basic operations on the collection subscript and element. The list below shows the collections available and their applicability with the different collection types. If the collection is NULL, system raises COLLECTION_IS_NULL exception. The collection information includes their null behavior of the collection, and element count. The basic utilities provided by Oracle are collection extension, deletion, and trimming. All collection methods are compiled along with their behavior, in the below table. These collection methods can be used as PL/SQL construct. Oracle does not support the collection methods in SQL. Now, we shall study the usage of collection methods. The method checks a collection for the NULL property. It returns FALSE for null collections while TRUE for initialized ones. It is the only collection method which is capable to work with NULL collections. Note that if the input index value is out of range of the collection, system raises SUBSCRIPT_OUTSIDE_LIMIT exception. Check the below illustration to demonstrate its use. The method counts the number of elements in a collection. Check the below illustration. Check the below illustration to demonstrate the use of COUNT method. The method returns the maximum count of elements in a collection array. It can only be used with VARRAYs. Note the difference between COUNT and LIMIT methods in the below example. The methods return the first and last subscript of a collection. For an uninitialized or empty collection, the method values are NULL. Check the below illustration to demonstrate its use of the methods. The method give the subscript which is before and after the current subscript. These methods are used as to avoid NO_DATA_FOUND exception in sparse collections. The method allows addition of new elements to a persistent collection. By default, it appends one element to a collection. Upon specification, it can add N elements to a collection. EXTEND(m,n) make ‘m’ copies of nth element to a collection. Note that is cannot be used for Associative arrays. The method drops a cell from a collection. It removes a single element by default, but can remove N elements and even by range, if specified with the method.